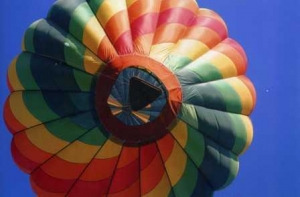 Experience Flying | Hot Air Balloons Fly High in Rock Hill! 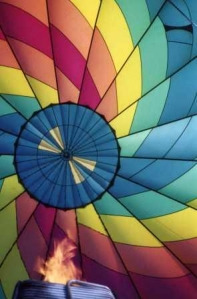 “I have always thought hot air balloons were cool. So graceful as they quietly passed overhead with the occasional sound of the propane torch heating the air inside. And considering my fear of heights, I really didn’t have a desire to ride in one. 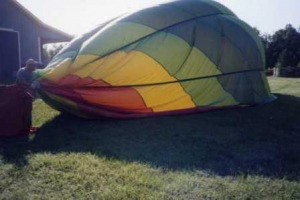 Until one landed in my pasture in 2005. I began to look at them a little differently. 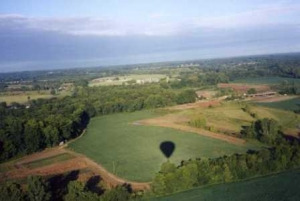 You really must read about the balloon landing in my pasture to get the full meaning of why this ride was so important to my family, friends and I. 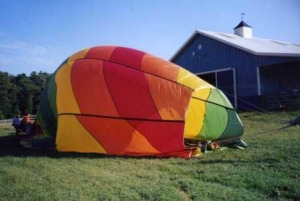 My two oldest children and a friend went together and purchased a ride in that same hot air balloon for my husband and I. And I couldn’t let them down. I had to bite the bullet and overcome my fears. Part of the ride is helping get the balloon out of the trailer, assembled and risen to its full glory. Thankfully, the owners and operators of the Eagles Wings Hot Air Balloon took pictures during the process and shared them with us. And I’m about to share them with you as I fill you in on the process of what it takes to get a hot air balloon in the air. I’m sure I’ll miss a thing or two, I’m not a pro, just a helper and a balloon chaser when our schedule allows. Everyone meets before daylight and drives to the take off location. 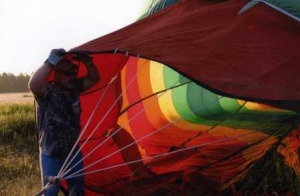 The pilot sends up a helium filled balloon to see in what direction the wind is blowing and what kind of wind speed there is at different levels of the atmosphere. We unload the gondola and propane tanks. This is me. Holding the opening of the balloon. 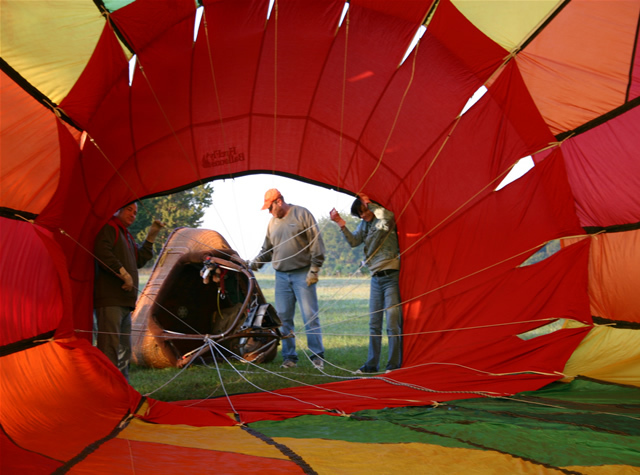 We take one end of the balloon out of its bag and lay it on the ground while the rest of it is still in the bag inside the balloon trailer. 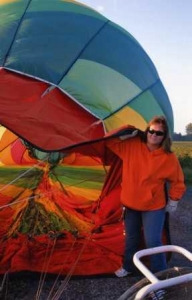 The driver of the vehicle pulling the balloon trailer begins slowly driving as the rest of the balloon is carefully pulled out of the bag and layed on the ground. Once the balloon is on the ground, misc. cables and straps are untangled and attached to the balloon. And the balloon is attached to the gondola. At which point a very powerful fan is pointed toward the inside of the balloon and turned on to fill the balloon with air. 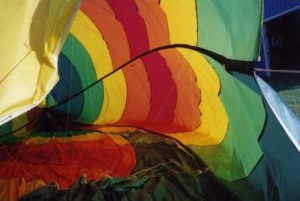 While the fan is filling, the helpers are working both sides and the top of the balloon to pull it out and help the fan fill it out with air. This is The Captain (not to be confused with the pilot). Holding the other side of the balloon opening. 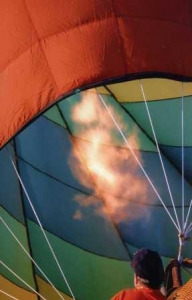 Once the balloon is full of air, the propane torch is lit and begins heating the air inside. As the air heats the balloon begins to rise. The pilot is usually inside the gondola at this time and the people on the ground must hold down the gondola and balloon to keep it from drifting away. This is the pilot, Robert Sarratt, manning the propane torch. Then it’s time for the guests to climb in. We climbed in and wait for lift off. I’m not exactly sure at which point I realized we had left the ground but it happened so gracefully I never felt it leave the ground. I just looked down and we were already about 8 feet up. At that point, it took my breath away. Kind of a small panic attack. But I quickly got it under control. It was absolutely amazing up there above the trees and power lines. The only sound was the occasional sound of the propane torch or a bird flying by asking who we thought we were up in THEIR sky. We could see for miles all around. We could see the balloon chasers, our family and friends in a convoy. Chasing. Stopping. Turning around. Getting out to look. Chasing again. It was almost comical from our birds eye point of view. 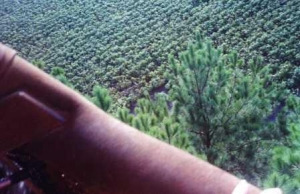 The pilot was in communication at all times with the chasers, with a hand held walkie talkie. Not that he needed to be, it’s only for emergency and landing purposes. This was taken from inside the gondola. Looking up into the center of the balloon. It’s beautiful and peaceful up there. This was before I had a digital camera or there would have been a whole lot more pictures. This is a spring cotton field. 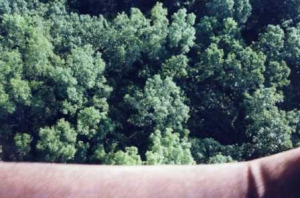 The object at the bottom of the picture is part of the gondola. Notice the balloon’s shadow. So cool! The Captain and the pilot pulled leaves from the “TOP” of the oak trees as we were descending. That will make you think! Especially when you are afraid of heights! Leaves from the top of the tree?! No way was I leaning over the side to grab some leaves. I was happy just looking at them and knowing I was getting a birds eye view. Beginning our descent. TOPS of the trees. Here, we are skimming across a cotton field. These are cotton plants. We didn’t land in the cotton field, but just beside it. 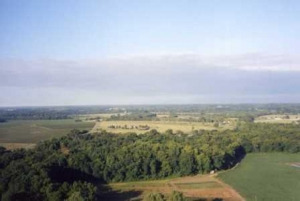 Here, we are awaiting permission from the land owners for the chasers to drive out and pick us and the balloon up. 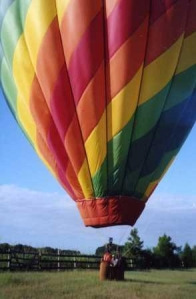 The pilot stayed in the balloon as The Captain and I guided it over to a place the chasers could drive to. It was cool walking along holding onto the gondola as it hovered just above the ground. The end of the day. Packing up the balloon. It was an amazing trip. Will I go back again? Yeah, probably, but I’ll have to deal with the whole fear of heights thing again.